Neocaridina davidi var. 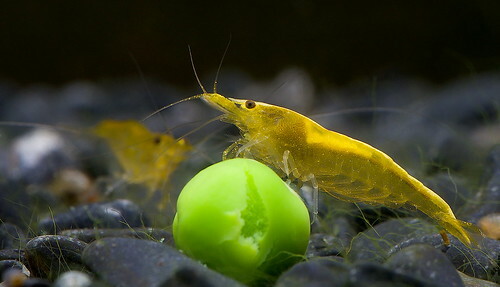 Yellow, commonly known as yellow shrimp, is one of the most popular shrimp varieties in the hobby. As the name suggests this shrimp is selectively bred for its super bright, eyecatching yellow color. It is unfussy about water values and breeds easily, which makes it a great option for anyone just starting out. 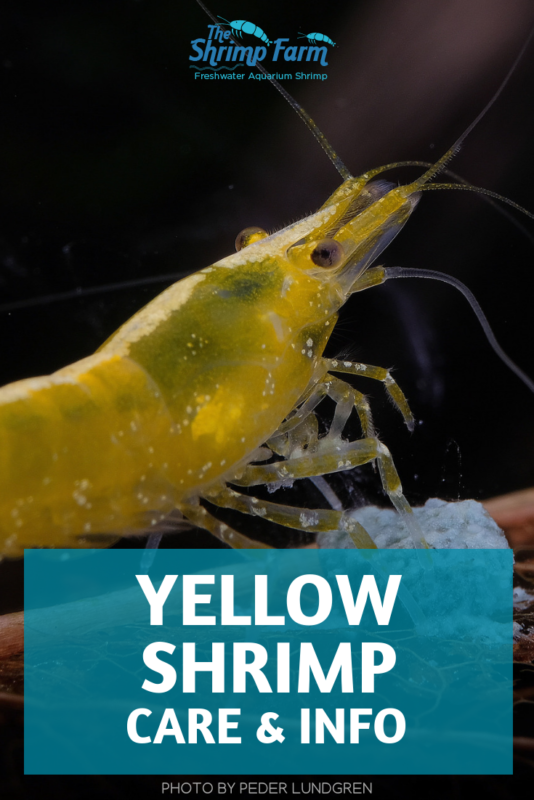 Keep reading for everything you need to know about yellow shrimp care and keeping yellow shrimp in your own aquarium! 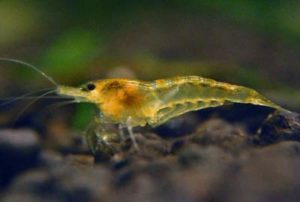 Yellow shrimp are one of the easier shrimp species to keep and don't have many specific requirements. No special soil types or fancy equipment needed! Like all dwarf shrimp they can be kept in aquariums of at least 5 gallons, although for beginners and anyone concerned about water quality it's always a good idea to go for a slightly larger setup. As with all shrimp the aquarium should be filtered and fully cycled before any livestock is introduced. Any filter should work well but keep in mind that baby shrimp are very small. Always use a prefilter sponge (or, alternatively, a sponge filter) to prevent them from disappearing into the intake. A heater isn't necessary as these shrimp can tolerate a very wide range of temperatures as long as things are stable. Shrimp are prey animals that don't feel safe in open spaces. so be sure to provide your yellow shrimp with plenty of hiding places. Don't worry about not ever seeing them: the safer the shrimp feel the more time they spend out in the open. Fine-leaved plants, shrimp tubes, rocks and driftwood all provide shelter and should work well. You can also add leaf litter to imitate their natural habitat and as an extra food source. Like their cherry shrimp cousins, yellow shrimp are very adaptive and can survive in a wide range of water values and temperatures. As long as the water is conditioned, ammonia and nitrite are always at zero and nitrites aren't too high your tap water should usually be fine. Be sure to do regular water tests using a liquid test kit to make sure everything is still in order and perform regular water changes. Because yellow shrimp breed so quickly there are a little more options than usual when it comes to tankmates. Even if a few young are occasionally eaten new ones should appear quickly enough to sustain the population. If breeding isn't your primary goal you can keep these shrimp in peaceful community aquariums. Other shrimp/invertebrates and small schooling fish like pygmy Corydoras should pose little threat. You can even consider slightly more "aggressive" fish, like livebearers, as long as there are plenty of hiding places for young shrimp. If your main goal is breeding it's a good idea to stick to just shrimp and maybe a few peaceful snails. Be sure not to mix multiple Neocaridina shrimp species unless you know what you're doing; the color combinations look great at first but interbreeding will result in offspring with brown wild-type coloration. Yellow shrimp are omnivores that thrive on a varied diet. They will love picking algae and aufwuchs off any surface they can find, but unless your tank is very algae ridden they do need regular feedings. Use a high-quality shrimp food as a staple and supplement it with algae tablets, frozen foods (mosquito larvae, bloodworms), fresh blanched veggies and sinking fish foods. Be sure to remove any uneaten food after a few hours as it can quickly start rotting and affecting water quality. Consider using a feeding dish to prevent the food from ending up all over the aquarium. Breeding is definitely the most fun part of keeping yellow shrimp, as these Neocaridinas are among the easiest shrimp to breed. They're basically set and forget, which makes them a great choice for beginners or anyone looking for a breeding project that's not too effortful. To breed your yellow shrimp, introduce both males (smaller, less bright colors) and females (larger, bright coloration) into the aquarium. Keep the water quality high and provide plenty of food. Healthy females should soon start carrying little eggs between their back legs (swimmerettes), from which tiny copies of the parents hatch after around 30 days. If you're breeding yellow shrimp to sell, keep in mind that some are higher "quality" than others. The more intense a shrimp's coloration, the higher the grade it falls into. Higher grade shrimp with opaque, bright colors will fetch more money than translucent ones. This is just a color thing, though; yellower shrimp are not healthier or inherently better. 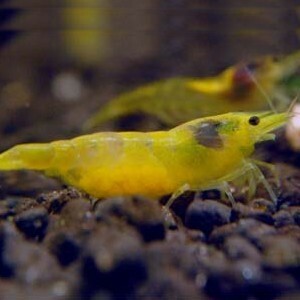 With the growing popularity of the shrimp hobby including Neocaridina varieties like this one, it shouldn't be too hard to find yellow shrimp. Your local aquarium store might sell them or you can try finding another hobbyist willing to sell or trade a few. If you don't want to leave the comfort of your home, you can buy high quality yellow shrimp at The Shrimp Farm here and have them shipped right to your doorstep!